Glasgow City Council staff have raised almost £23,500 in sponsorship to help homeless people. 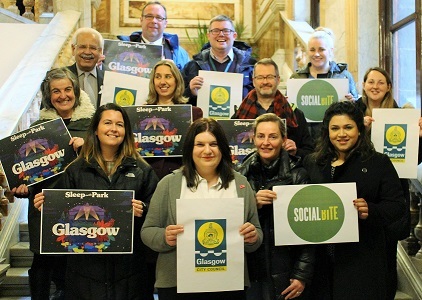 A team of around 55 volunteers, including staff and councillors, braved the cold to support Social Bite's first Sleep in the Park Glasgow event at Kelvingrove Bandstand. As this was written, the team had raised more than £23,400 in sponsorship, including gift aid, and the total was still rising. The council also donated a further £10,000 to the charity. Simultaneous Sleep in the Park events took place in Dundee, Edinburgh, Aberdeen and Glasgow on December 8th. Social Bite rasied more than £3.2million in total after up to 12,000 people across Scotland took part including up to 2500 in Glasgow. Torrential rain hit Glasgow in the hours before the sleep out, but luckily it stopped before everyone bedding down on the ground for the night in sleeping and bivvy bags. The hardy GCC team was headed up by council Leader, Cllr Susan Aitken. Cllr Aitken said: "All credit to Social Bite who have made Sleep In The Park a mass participation charitable event which is now on a national footing. "There is a real willingness within the public to do something about homelessness and rough sleeping as the response to these events in Glasgow, Edinburgh, Dundee and Aberdeen shows. "The response we have had from staff internally, over and above the council's £10,000, is a further indication of what this issue means to individual elected members and staff. A huge thanks to them for all their support and efforts. "Homelessness is a pressing social issue we at the council are engaged with every single day and which the wider austerity agenda does nothing to improve. "It is hard for any of us to imagine the lived experience of those who are homeless or rough sleeping but Sleep In The Park allowed us to do something as individuals. It was amazing to see so many people from all walks of life coming together to do their bit." Glasgow's Lord Provost, Eva Bolander, donated a bottle of limited edition whisky to be raffled in aid of the fundraiser. The raffle raised £412 which boosted the team's tally. The winning ticket, drawn at random from a hat, belonged to Brian McHugh, a Senior Mechanical Engineer in Development and Regeneration Services. Brian said: "I was really surprised to win! I never expected it - I just bought the tickets because it was for a good cause. I won't open the whisky - I'll keep it, as it's a limited edition bottle in a smart presentation box." Legal Services also raffled two Christmas Hampers raising £600 from ticket sales to boost the team's total. Josh Littlejohn, Co-Founder of Social Bite, thanked the council for its support. He said: "Glasgow City Council has done something amazing by supporting this campaign to help vulnerable people. Staff and councillors are also giving up their beds on a cold Scottish winters night to raise money for, and awareness of, homelessness. Staff have doubled the council's £10,000 donation through sponsorship. "Together we can not only raise money, but consciousness, and stick up for some of the most vulnerable people in Scotland. We can create a collaborative movement, working closely with local and national government as well as the homelessness sector, to make a massive difference to the lives of homeless people in Glasgow and Scotland. Thank-you for your support GCC." 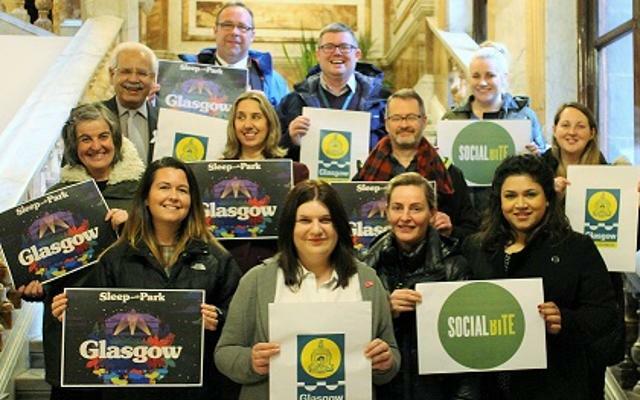 Caption: Some of the Glasgow City Council staff and councillors who raised funds for Social Bite and taking part in Sleep in the Park.